There have been three different Unitarian congregations in Palo Alto: the Unity Society, gathered in 1895, organized in 1896, and disbanded by about 1897; the Unitarian Church of Palo Alto, formally organized in 1905, and finally dissolved in 1934; and the Palo Alto Unitarian Society, gathered in 1947, the forerunner of the present Unitarian Universalist Church of Palo Alto. The first chapter of this book has biographical entries for the few people we know were associated with the Unity Society. The second chapter, a much longer chapter, has biographical entries for many of the names appearing in the extant written records of the Unitarian Church of Palo Alto. There are also entries for a few other Unitarians who lived in Palo Alto, but who were apparently not affiliated with the church. The second chapter also highlights six multigenerational Unitarian families, giving several examples of how Unitarian affiliation continued across generations. Family groups are preceded by a family tree, and each family group ends with a typographical ornament. This book represents my interest in telling the stories of ordinary Unitarians. Most historical accounts of Unitarianism focus on institutional history at the denominational or congregational level, or on the biographies of prominent Unitarians. Institutional histories typically focus on ministers and perhaps other paid staffers such as musicians; famous persons who are part of the institution; and prominent lay leaders. However, given the realities of sexism, racism, and class bias, histories of this type will tend to minimize the importance of women, children, non-white persons, working class persons, and less-educated persons who are part of Unitarian congregations. This book also represents my interest in telling the stories of Unitarian women. In Palo Alto, there were Unitarian women in leadership positions beginning with the Unity Society. The Women’s Alliance of the Unitarian Church left excellent records, documenting how women provided funding and lay leadership for the congregation as a whole. 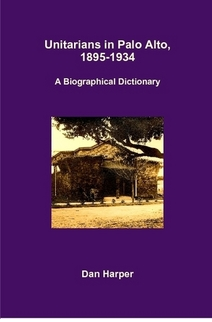 A biographical dictionary which includes most of the people in the congregation places equal importance on men’s and women’s stories. I am also interested in trying to document the complex net-work of relationships which arguably are the most important element of congregational life: more on this below. Originally, I had hoped to be able to do statistical analysis of the Unitarian Church of Palo Alto, particularly to investigate socio-economic class status. I wanted to answer questions like: How many had college degrees? How many had servants living in their homes with them? How many had passports and were able to afford overseas travel? However, I soon realized that ac-curate statistical analysis was not possible without an accurate list of everyone who was affiliated with the church. Membership rolls and donation records are no longer extant, and I estimate that I had the names of perhaps only half of the members of the church. Thus statistical analysis is impossible, and these questions remain unanswered. I had also hoped to be able to investigate the ethnicity of the Palo Alto Unitarians. Racially, these Palo Alto Unitarians were homogenous, almost entirely non-Hispanic whites. Ethnically, though, Palo Alto Unitarians were somewhat less homogenous. A surprising number of them were first or second generation Germans, many of whom spoke German as well as English. However, tracking ethnicity proved to be challenging, and I was able to reach no firm conclusions. A related question: many of the Stanford professors and students who were part of the church seem to have been affiliated the German department, more than would have been expected by mere chance. This may be related to the apparently large percentage of first and second generation Germans mentioned above, but still we have to ask: Why so many German speakers? The answer may be because of the prominence of German as an academic language in the early twentieth century; social networks among German speakers; or even because of strands of liberal religion among German immigrants made them sympathetic to Unitarianism. Yet this question also remain unanswered. The most interesting problem for me remains the problem of how to trace social networks within a congregation. Social networks are incompletely or poorly documented in the written record, so it is convenient for the historian to ignore them. Yet from for many of these Palo Alto Unitarians, their experience of and participation in social networks may be just as important as Unitarian theology and ministers, the building, denominational affiliation, etc. How can we trace social networks within a congregation, either at a given point in time or over a length of time? My methodology has been to compile this biographical dictionary, but I consider this only a provisional solution. A better methodology is needed to trace social networks among ordinary Unitarians. In short, this biographical dictionary offers incomplete answers to what I hope are some interesting questions. Perhaps future researchers will be able to investigate these and other questions, to learn more about how ordinary people experienced religion and religious institutions. Inevitably errors appear in a complex research project like this, which extended over five years and took hundreds of hours. Up to the moment the book went to press I was correcting typographical errors, errors of fact, and errors of interpretation; but finally I had to move on to other projects. I apologize for the many errors that doubtless remain uncorrected. Do you have the actual street address of the First Unitarian Church in Palo Alto, 1905-1934? I know it was at the corner of Cowper and Channing streets. According to the 1915 Directory of Palo Alto, Mayfield, and Stanford Univ. (Palo Alto: Times Publishing), the address was 503 Channing Ave.
Ellen, thanks for the comment. Frances Schlegel was actually born in Massachusetts, though I believe her father was born in Germany. Other reasons William spoke German: he got his BA in modern languages (which would have included German) from Kansas (this was before he married Frances); he did post-graduate work in Berlin and Munich; thus his ability to speak German was also partly due to his academic focus.